Last night about 1 AM, my dog started barking, thought she was barking at the deer, as usual. But noticed her bark was a little different, so I went to the door and knocked for her to come. When she got to the porch, she turned and started looking at the ground, ran back down the stairs and stood about the place she was looking before. So I grabbed the flashlight, my pistol and went to check it. What I found was a king snake eating a copperhead. All my years I have never seen this in action, so I woke the kids and the wife to come watch. Almost at the the end, the copperhead's tail wrapped around a small branch and knotted up, so mr.king snake couldn't get him all the way down. So I helped him out by untangling the branch and allowed him to finish dinner. After he was done, I picked the king snake up and relocated him about 100yrds from the house in the pasture, that way my dog wouldn't kill it. Thought that was pretty cool to watch. Sorta like what the DNC did to Bernie. Or Stalin v. Hitler. The analogies are endless. Last edited by J.R.@A&M on Fri Sep 14, 2018 8:22 pm, edited 1 time in total. That is something I have never seen in person either. 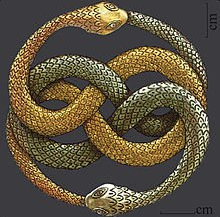 I am not a snake fan, but any thing that kills coopeheads can’t be all bad. Excellent! I had heard of it but never seen it happen. I'm trying to get some sort of scale. Assuming those are not giant leaves, then neither of those is a very big snake. Correct? 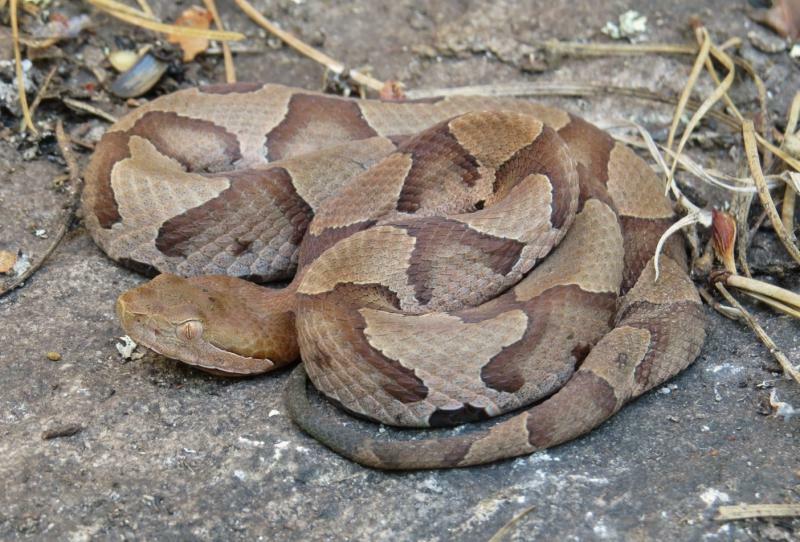 The copperhead doesn't look much smaller than the king snake though. Awesome! 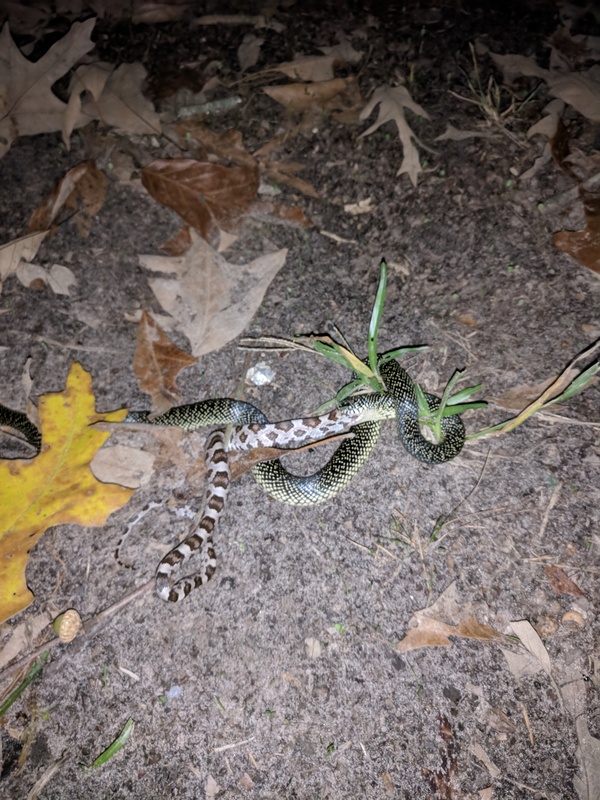 I've seen a few speckled king snakes on my place, but never saw one eat a copperhead. What an experience! After a bit more looking at my pic, I have concluded that the snake being the meal, was not a copperhead, but a glossy snake. 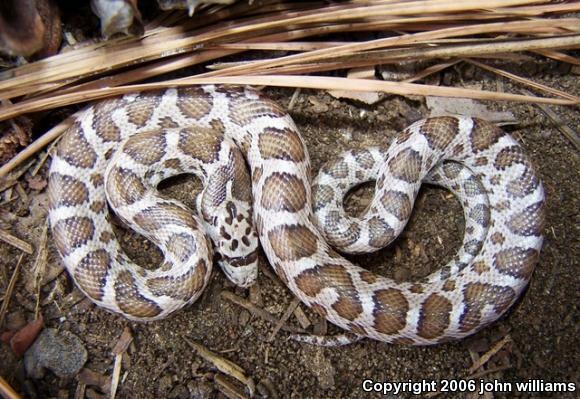 The glossy snake is non-venomous, mostly nocturnal and it's diet is mostly small vertebrates, like mice and lizards. Still cool to see anyways. King snake was about 12in long, other was about 8-9in. The shape of the head would have been a quick identifier, but Mr. King Snake didn't allow you that view! Still plenty of justification for letting the non-venomous snakes be. It looks like a rat snake to me. Normally I feel that most snakes are beneficial to the environment, particularly anything called a Rat Snake. However, our local biologist recommends eliminating rat snakes whenever we find them because they're very detrimental to ground nesting birds (like turkeys).